Formula Auditing for Excel (A+ Formula Inspector) is an Excel add-in utility designed to help analyze and audit Microsoft Excel formulas. The Formula Auditing add-in provided a new formula window with menu options to quickly locate cells that are referenced in a formula and easily navigate to those cells. The Formula Auditing for Excel add-in is a much more user friendly solution than the built in Excel auditing toolbar in order to save time and more efficiently detect potential formula errors. Save time when reviewing and auditing Excel formulas. Reduce frustration by quickly understanding what a formula does. Find errors in formulas much faster and efficiently. Quickly trace and locate cells referenced used in a formula. Easily navigate to cells used in a formula. View values of cells or partial formula calculations right in the formula. Learn formulas and how they work faster. Quickly understand formulas that have been created by other users. 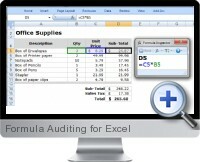 Formula Auditing for Excel is compatible with Excel 2000 or higher.